Librarians provide critical early literacy services for children ages birth to four. By offering engaging play opportunities, age-appropriate materials and access to dynamic programs, the library plays a key role in fostering the emergent literacy skills essential to school readiness. Along with the programming librarians deliver, the physical learning environment that the library provides plays an important role as well. Providing interactive, developmentally appropriate spaces encourages literacy, math, science and other developmental skills on a variety of levels. 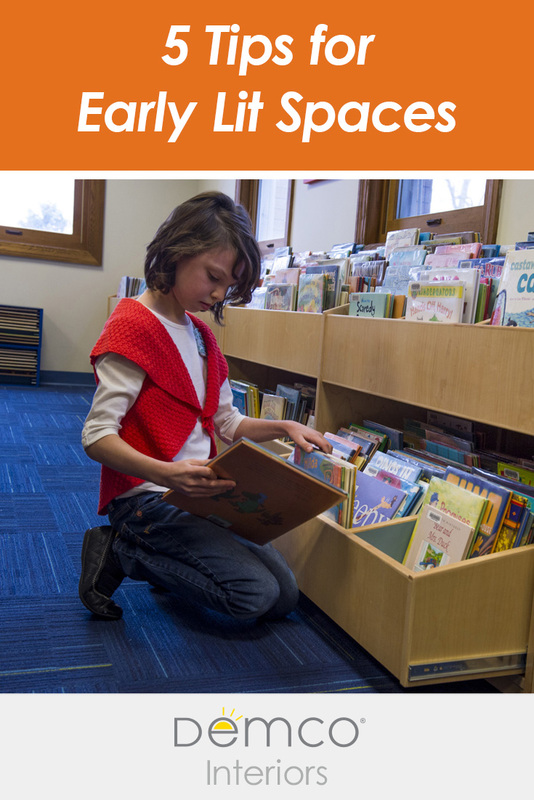 To help you evaluate your library spaces for your youngest patrons and their families, consider the tips below. Include child-size furnishings for kids to sit on by themselves or to interact with one another, such as Kidovation® furniture. Incorporate floor cushions or other soft seating (10-inch-high seats) for storytime and other programs. Display picture books and board books in floor-level, face-out, flip-through book browsers to attract the interest of your youngest users and increase your circulation. Use all available space to actively engage children (for example, use end panels for interactive elements). Make sure your play items and reading materials are easily accessible and designed for safety for little hands. Strategically place carpets for the safety of children who are crawling, learning to walk and actively interacting with the space. At Joshua Hyde Public Library (MA), the collection is made accessible using face-out ColorScape® book browsers. 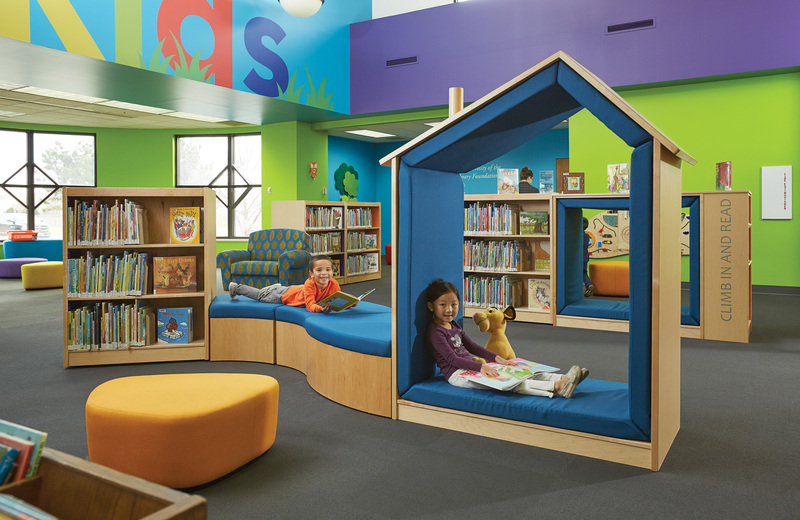 Kidovation furniture is designed for kids and includes literacy-building elements in its design. Colors and visuals can have an effect on the mood and tone of your space and can also provide learning opportunities for patrons. Use a warm color scheme for your overall space. Be aware that color brightness and intensity are useful for attracting attention, but they may not be conducive to learning. Consider brighter colors for accents. Include engaging posters, artwork and other visually appealing items in your space, including images of letters, numbers, colors, etc. 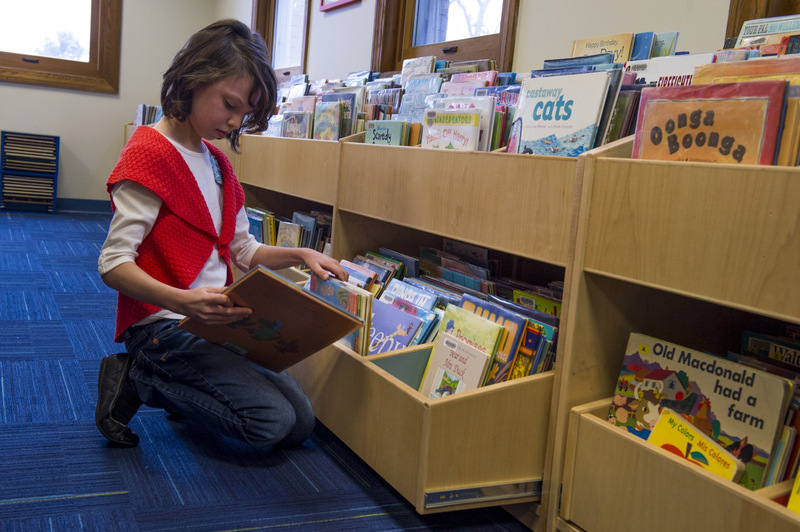 Use pictorial signage and images to help young, nonreading patrons find their way through your collections and your space. Need Help Reimagining Your Children’s Spaces? Whether you need kid-sized furniture, want to add interactive play elements, or need help redesigning your space, Demco can help. Contact our interior solutions consultants to get started. 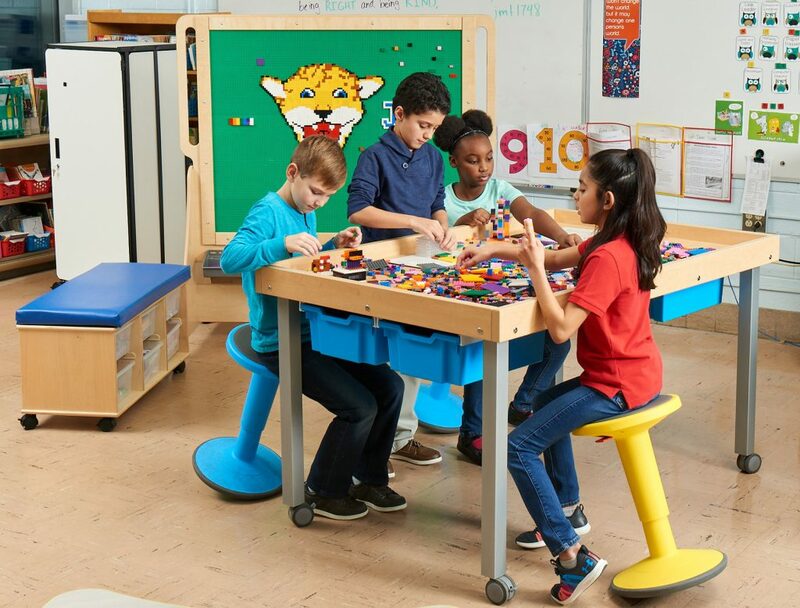 3branch Discovery Tables encourage children to build and invent. Make use of interactive end panels, learning walls and flannel boards. Create natural gathering spots and spark role play with play kitchens, train tables, general store sets and farm stands. 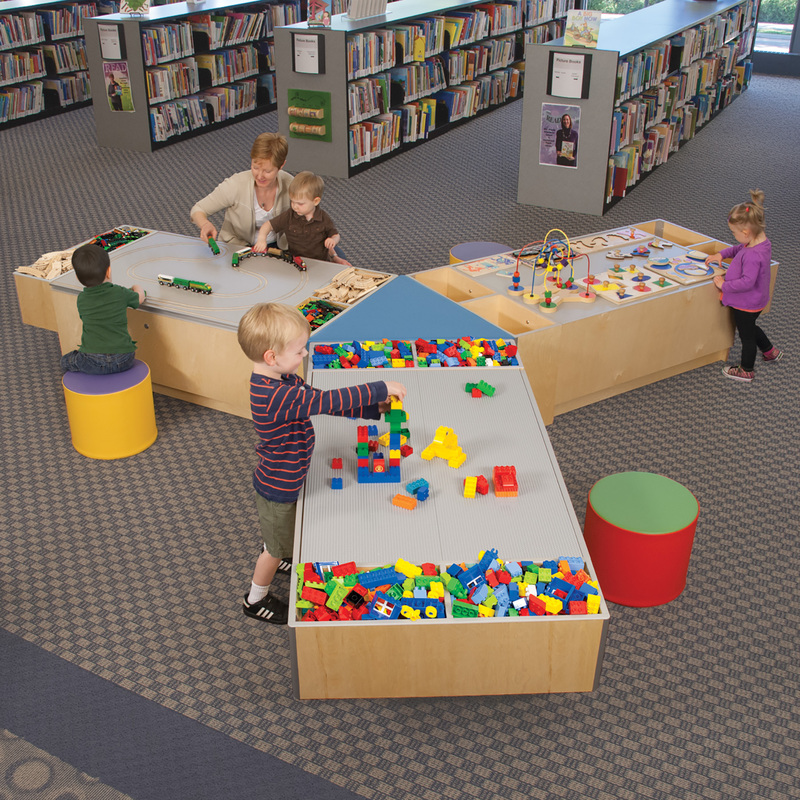 Incorporate early literacy technology workstations for ages two and up that include educational software programs and book-preview kiosks that encourage children to explore the library’s collections. Create a print-rich environment and provide opportunities to interact with letters and language, such as a large magnetic letter board, counting blocks, art materials and writing paper (and a mailbox to deliver letters). Provide a place for kids to be creative through singing, inventing stories and/or acting out stories they’ve read. This could simply be an open area that encourages general activity, a puppet theater or a small stage with puppets and/or dress-up accessories. Provide experiences that allow children to explore STEM concepts, such as chunky building materials or leaves and other materials to make crayon rubbings. Create displays of children’s books that focus on STEAM concepts to encourage read-alouds and checkouts. If possible, set up a fish tank or terrarium and encourage children to observe what they see. 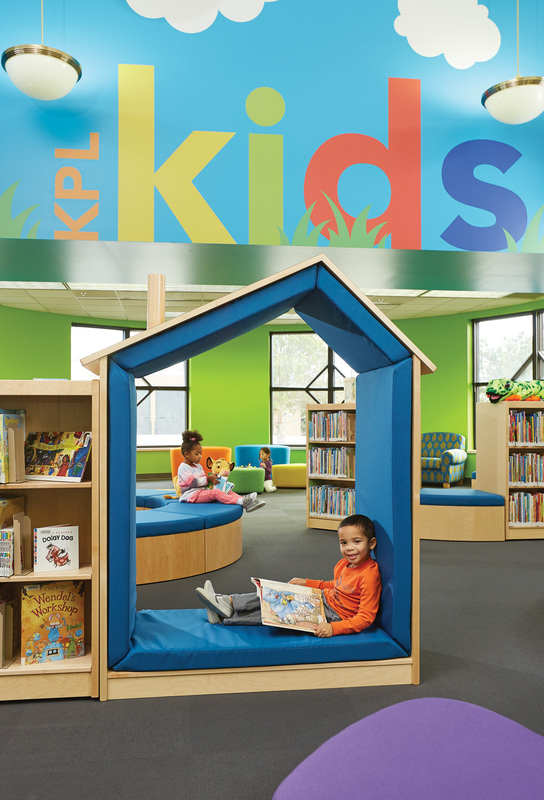 Kenosha Public Library (WI) provides space for seating, exploration and play. 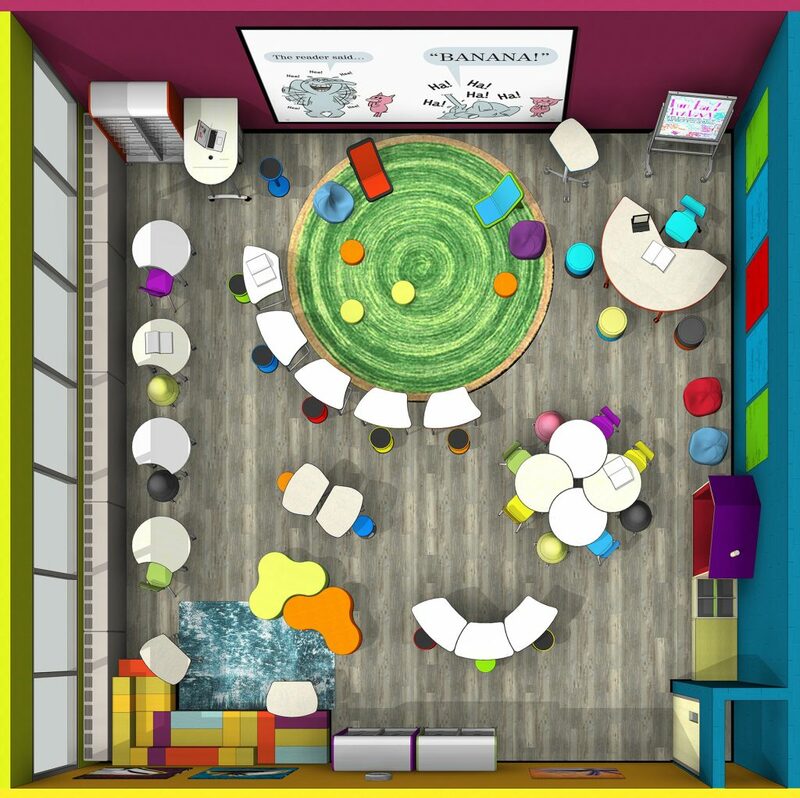 See the details of the library’s youth area. The space should be built with the comfort of both your youngest patrons and their caregivers in mind and also encourage interaction between the two. Provide adult-size seating for caregivers to relax and get comfortable for read-alouds to their children. Post signage aimed at caregivers with tips on how to interact with their children through books and play to develop early literacy and math skills (e.g., talk about the colors or shapes they see, count as they are playing with manipulatives, compare and contrast things they see). Post “I wonder…” statements, such as I wonder why the sky is blue? I wonder how birds build nests? or I wonder what makes a car go?, to encourage caregivers to wonder aloud and explore answers with their children. Arrange the space in a way that provides clear sightlines to play and collection spaces. 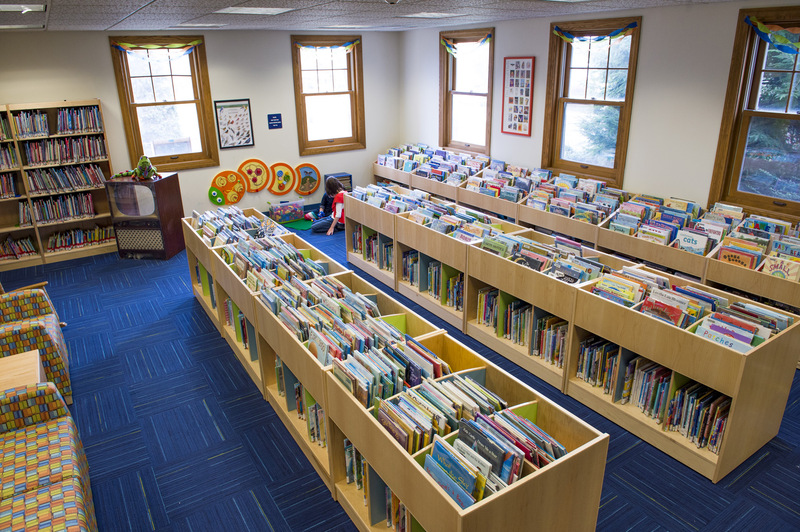 Place relevant parenting resources and materials conveniently throughout the space, such as parenting books and magazines, early literacy tips, storytime kits, etc. Create social spaces for caregivers to socialize. Encourage kids to clean up when they are finished playing. Stickers and stamps are simple ways to reward young helpers. Provide storage bins and/or shelving labeled with both words and pictures for easy organizing. Angela has 10 years of experience in the design field and has a passion for art and education. She loves how a well-designed educational space can make opportunities accessible to all, and she excels at transforming seldom-used spaces into learning environments that fit the evolving needs of today’s students and library users. For Angela, the most rewarding part of working in library & educational design is being able to work on projects that have a significant impact on students and communities. Angela holds a Bachelor of Fine Arts in Interior Design from the International Academy of Design and Technology. Amber is well versed in educational products and interior design. She has a particular interest in designing youth spaces and loves incorporating new and innovative products to create engaging environments. She also finds it rewarding to design more efficient library and school interiors that help improve community engagement by encouraging and inviting interaction. Amber holds a Bachelor of Fine Arts in Interior Design from the University of Wisconsin–Stout and also minored in Sustainable Design and Development. She continues to stay up to date with modern practices and in touch with the design community by being a member of the International Interior Design Association (IIDA) and attending furniture conferences and events.